You can reserve your place by paying £10 through paypal now. Drop in and join other beaders/ jewellery makers to chat, discuss, experiment and simply have a good time together. Join us for a creative, social, relaxed time when we can bounce ideas around, learn from each other and get away from it all without any pressure. * SPECIAL PROJECTS: Wire Links, Rings, Earrings, Bangles, Pins and more. At each session I will show you how to make a different item of jewellery. You will then be able to experiment and adapt the technique to make very individual pieces at each drop-in for those who want to learn more - or you can just chill out and do your own thing. * £10 per session, materials for project included. There are up to 8 places available. 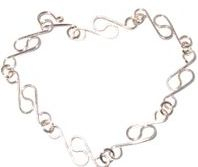 'Links' are usually suitable for earrings, pendants, bracelets and chains.